Imagine this: somewhere between 86 and 128 people, captured or surrendered at the end of a siege, are stripped naked, lined up against the side of a cliff, and summarily executed without trial by government forces. Couldn’t happen here, many people would probably say. But it did, and the story behind the worst massacre in New Zealand history deserves to be more widely known. In July 1868 Te Kooti Arikirangi Te Turuki and nearly 300 other mostly East Coast Maori escaped from the Chatham Islands (Wharekauri) and made their way back to the mainland. This group, known as the Whakarau, had been held at Wharekauri since 1866. None of their number had been tried, and the government admitted that they were being held as ‘political offenders’ while arrangements were made to confiscate their lands back home. Judith Binney suggested that Te Kooti had been included among those illegally imprisoned at Wharekauri because he was regarded as a threat by rival traders back in Gisborne (Turanga). Te Kooti, Binney argued, had every incentive to seek utu from those responsible for his long exile and imprisonment. But despite this, when the Whakarau landed back on the mainland, Te Kooti indicated their desire to travel peaceably inland. Captain Reginald Biggs, one of those response for Te Kooti’s earlier arrest and detention, blocked the Whakarau’s only route of escape and engaged them in a series of battles over the following months. In the early hours of 10 November 1868 Te Kooti struck back, killing Biggs and more than 50 others, including women and children, at the settlement of Matawhero. Many of those killed were, like Biggs, members of the colonial militia or their families. Others were Maori suspected of assisting the government. Following this attack, the government vowed to seek revenge for those slain. A reward of £1000 was placed on the head of Te Kooti, dead or alive. 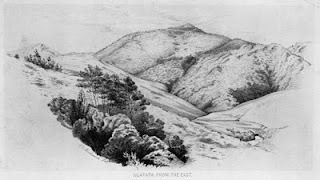 By December the Whakarau had retreated to Ngatapa, a hilltop fortress in a strong defensive location inland from Gisborne but without a secure water supply. Government troops and their Maori allies besieged Ngatapa in early January 1869. Their water supply exhausted, in the early hours of 5 January Te Kooti and many others escaped down a steep cliff and into the bush. Crown forces spent two days hunting down prisoners, who were brought back to the camp at Ngatapa. In all some 130 odd of the defenders of Ngatapa were captured in the bush and gorges below the pa where they lay asleep having had neither sleep nor water for 2 days. They were marched up the hill side again under the outer wall – as it were – of the pa they had defended so long and so heroically, stripped of every vestige of clothing they possessed and SHOT – shot like dogs. There was no mention of a trial or if any or all of them had participated in the PB [Poverty Bay, Matawhero] Massacre. That did not matter to us one straw. They were shot and their bodies left to swelter and rot under the summer’s sun and bones to bleach to this day. And all this – and very much more – as done beneath the meteor flag of Mighty England. While the precise number of people extra-judicially executed in this manner has been much debated, the Waitangi Tribunal concluded, after a careful review of the evidence presented during its Turanga inquiry, that the figure was between 86 and 128 people. The Crown had argued during that inquiry that the number may have been as few as 8 people, while also pointing the finger of blame at the Crown’s Maori allies – both arguments that were emphatically rejected by the Tribunal. In the words of the Turanga Tribunal, the Ngatapa executions were (and are) ‘a stain upon the history of this country’. Yet to this day there is no monument or memorial to the victims of Ngatapa and precious little recognition of the worst Crown atrocity in New Zealand history.